I’m very excited to share another interview with a YA author today! Meet Stacey Lee, author of the fantastic YA Historical UNDER A PAINTED SKY. Stacey mentored me in a writing contest almost three years ago, and since then I’ve had the pleasure of meeting her in person in Los Angeles last year. She’s a very talented writer and a wonderful person all around, and I’m delighted to share her words of wisdom with you! UNDER A PAINTED SKY came out almost a year ago. What were the highlights of your debut year? Anything you’d do differently? It sounds so cliché, but the highlights were really the people I met on the journey. The writers, the librarians, the teachers, the bloggers, publishing personnel. Even as in introvert, it was a pleasure to connect with so many people (like you!). There’s a lot of pressure on debuts to say ‘yes’ to everything, but I quickly learned what my limits were after coughing my lungs out into a plant at LAX. It’s easy to get sick if you overextend yourself. There’s definitely more pressure to ‘produce,’ though part of that is self-imposed. I’m trying to work on being more focused on my work when I have writing time. No futzing around. You have two books coming out in 2016, OUTRUN THE MOON and CATCH A FALLING HEART, can you tell us a little bit about your inspiration for those stories? OUTRUN THE MOON was inspired by my mom, a native San Franciscan whose father was born in 1906, the year of the San Francisco earthquake. As a fourth generation Californian, earthquakes are in the blood. CATCH A FALLING HEART (working title), was inspired by my nose, really. It’s about a teenaged perfumer wit an extraordinary nose who accidentally fixes the wrong woman with a love potion, and races to undo her mistake before her mother finds out. I have a kind of synesthesia that allows me to ‘hear’ musical pitches when I smell. Natural perfumery using plant based oils has interested me for years, and I run an Etsy shop called Mermaid Perfumes as a hobby. Your first two books were Historical novels, but CATCH A FALLING HEART is a Contemporary Fantasy novel, what made you want to switch genre? How difficult was it to do so? It wasn’t difficult. For me, affecting the right historical ‘voice’ is definitely more challenging than that of the modern day teen. I have been writing across genres all my life, and it’s always the story that hooks me, rather than the time period (both as reader and writer). A short story for an upcoming anthology which hasn’t been announced, so I won’t say more yet. But I’m very excited about it! Finally, do you have any reading recommendations? I just read a trio of forthcoming contemporaries: Charlotte Huang’s GOING GEEK, Lauren Gibaldi’s AUTOFOCUS, and Kathryn Holmes’ HOW IT FEELS TO FLY, and all three were so good and feels-y. I also listened to the audiobook of ARISTOTLE AND DANTE DISCOVER THE SECRETS OF THE UNIVERSE by Benjamin Alire Sienna, an important, emotional story of two gay teens. Thanks so much for the interview, Stacey! Thanks for having me, Eve! You can buy UNDER A PAINTED SKY here and add OUTRUN THE MOON on Goodreads here. 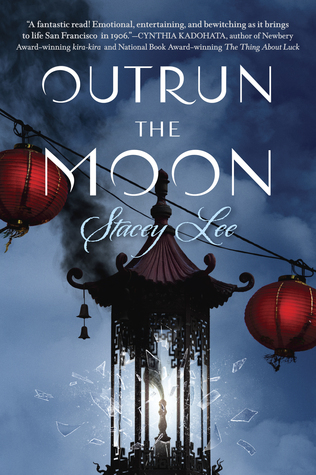 today I’m waiting on OUTRUN THE MOON by the fantastic Stacey Lee (expected publication: 24th May 2016 by G.P. Putnam’s Sons Books for Young Readers). I absolutely LOVED Stacey’s debut UNDER A PAINTED SKY, and I can’t wait to read her new YA Historical! REMINDER: there’s still time to enter my All Hallow’s Read Giveaway for a chance to win a copy of the YA Anthology SLASHER GIRLS AND MONSTER BOYS! More info here.